Ethylene glycol, the chemical commonly used as automobile antifreeze, was discovered recently in a massive interstellar cloud of dust and gas near the center of the Milky Way Galaxy. Scientists used the National Science Foundation's (NSF) 12 Meter Radio Telescope to detect this organic molecule. "Though we most commonly think of ethylene glycol as antifreeze, it actually is associated with the formation of more complex sugar molecules that are necessary for life," said Jan M. Hollis of NASA Goddard Space Flight Center in Greenbelt, Maryland. "Finding this molecule supports the view that prebiotic chemistry may first get started in interstellar space." 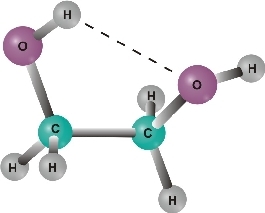 Hollis collaborated with Frank J. Lovas of the University of Illinois, Philip R. Jewell of the National Radio Astronomy Observatory (NRAO), and Laurent H. Coudert of the University of Paris at Campus d'Orsay to identify the ethylene glycol molecule. Their results were accepted for publication in the Astrophysical Journal Letters. The scientific team detected ethylene glycol in the molecular cloud called Sagittarius B, located 26,000 light-years from Earth near the center of our Galaxy. Though rarefied by Earth standards, interstellar clouds like this one can enable complex chemical reactions over time scales of hundreds-of-thousands or even millions of years. About 130 different molecules are known to exist in interstellar clouds. Ethylene glycol (a 10-atom molecule made up of carbon, hydrogen, and oxygen) is one of the five largest molecules ever discovered in space. It also is a chemically reduced form of 8-atom glycolaldehyde, the simplest member of the sugar family. This means that ethylene glycol can be produced from glycolaldehyde by the addition of two hydrogen atoms. Both molecules have now been detected in space by this team. "These detections suggest that the production of more complex sugars, like ribose, may be occurring in interstellar clouds," Hollis said. Ribose sugar is required for the backbone structure of RNA; a less complex form, deoxyribose sugar, is required for the backbone structure of DNA. "This discovery further demonstrates how important interstellar chemistry may be to understanding the creation of biological molecules on the early Earth," said Jewell. "Some scientists have even speculated that the Earth could have been 'seeded' with complex molecules from passing comets, which were formed from the condensing gas nebula that produced our Solar System." Astronomers on Earth are able to detect and identify the faint radio emission of molecules in space as they tumble and vibrate within interstellar clouds, emitting radio waves at precise frequencies. These frequencies are unique to each molecule, and provide a "fingerprint" in the electromagnetic spectrum. Signals from other molecules can sometimes fall at nearby frequencies, in effect smudging the ethylene glycol fingerprint. The scientists used four different signals from ethylene glycol to secure its detection. The researchers made their discovery with data taken in May 2000 with the 12 Meter Radio Telescope at Kitt Peak, Arizona, which has been a pioneering instrument in detecting molecules in space. 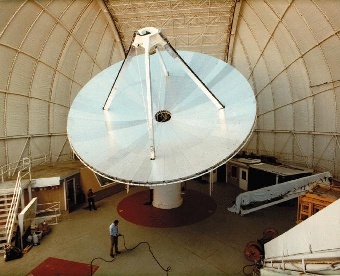 Though operated by NRAO at the time, this telescope now is operated by the Steward Observatory of the University of Arizona. The research team plans future work on interstellar biomolecules using the new NRAO Robert C. Byrd Green Bank Telescope, which promises to be the most sensitive telescope yet for such work.